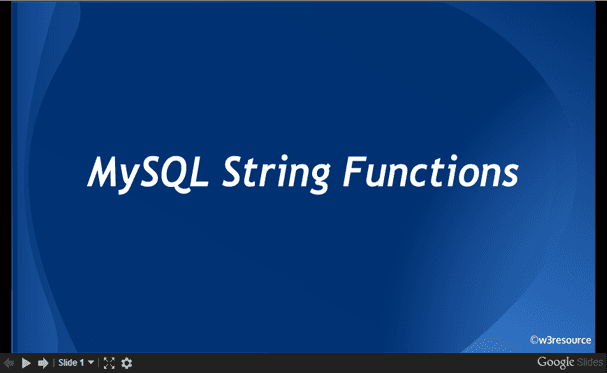 MySQL SUBSTRING() returns a specified number of characters from a particular position of a given string. 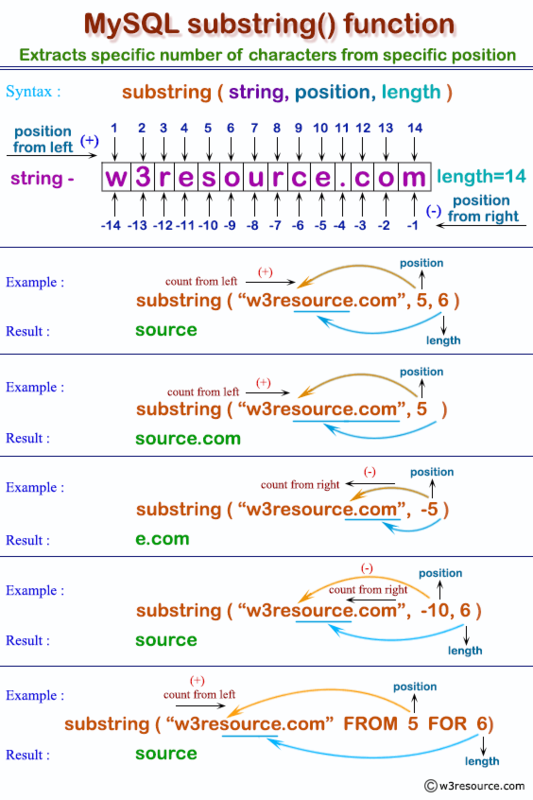 The following MySQL statement returns 3 numbers of characters from the 4th position of the string ‘w3resource’. The following MySQL statement returns 5 numbers of characters from the 4th position of the column pub_name for those publishers who belong to the country ‘USA’ from the table publisher. The following MySQL statement returns the remaining characters from the 5th position of the column pub_name for those publishers who belong to the country ‘USA’ from the table publisher. The following MySQL statement returns the remaining characters from the 5th position (Notice that FROM keyword is used) of the column pub_name for those publishers who belong to the country ‘USA’ from the table publisher. The following MySQL statement returns the remaining characters from the 4th position from the end of the column pub_name instead of the beginning for those publishers who belong to the country ‘USA’ from the table publisher. In this case the value of position of the beginning of the retrieval is negative. So the beginning of the retrieval is 4 characters from the end of the string rather than the beginning. The following MySQL statement returns the 5 number of characters from the 15th position from the end of the column pub_name instead of the beginning for those publishers who belong to the country ‘USA’ from the table publisher. In this case the value of position of the beginning of the retrieval is negative. So the beginning of the retrieval is 15 characters from the end of the string rather than the beginning. The following MySQL statement returns the 5 (Notice that FOR keyword is used) numbers of characters from the 15th (Notice that FROM keyword is used) position from the end of the column pub_name instead of the beginning for those publishers who belong to the country ‘USA’ from the table publisher. In this case, the value of the position of the beginning of the retrieval is negative. So the beginning of the retrieval is 15 characters from the end of the string rather than the beginning.